Email newsletters are a great way to stay in touch with your audience. They provide a direct connection to your reader, drive conversions, and delivers a higher ROI than social media channels. If you listen to the buzz about social this may seem counterintuitive, however email continues to outperform social across the board. E-newsletters allow you to tell your story, establish and define your voice, strengthen your message, and reinforce your brand identity. 1. Attention-grabbing subject lines. The preview screen on most mobile devices show the subject line and first sentence of your message. For most of your audience this maybe the only part of your message they see before they scroll on. You have 3 seconds to grab their attention and get them to open the email. One tactic is to state a surprising fact, asking a theoretical question, name recognition, referring to a timely world event, or making an offer. Test, Test, Test, there isn’t a perfect subject line, so know your audience and be creative. 2. Personalize. Once your reader opens the email, seeing their name in the opening line will pull them in. Personalization builds trust and connection while demonstrating your belief that the information you are providing will be important to them. 3. Incentivize. 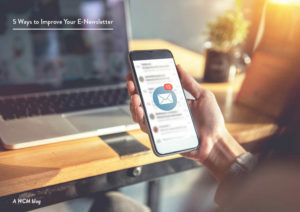 Rewarding people for joining your email list or clicking through to your site will motivate to engage, but it is critical that the content or services you are providing will keep themt coming back. Some ideas of incentives include a free PDF, a coupon, a one-time discount, and video or webinar access. 4. Keep it simple. Distill your content down to it essence – two to three sentences per article-linking back to your website if they want to read more. Bold numbers and statistics or use infographic. A clean design will engage the reader allowing them to scroll quickly and making it more likely they will open your next message. An email newsletter isn’t the place to say everything, it is the launching pad. 5. Design for mobile first. We have past the tipping point in the battle of the screens and mobile is winning. More than half of all email is first seen on a mobile device. Mobile-friendly design include serving mobile optimized image, concise content, highlighted links, and a responsive single-column template. Make sure to test your template across devices platform to ensure everything looks good and runs smoothly. Email newsletters provide opportunity for conversion and conversation. To maintain interest and relevance among decision makers in your field, keeps these tips in mind while crafting your next email newsletter.